As we start off the New Year in 2018 – personal and business goals are always top of mind. That’s great and all, but how will you get there? You need a plan! 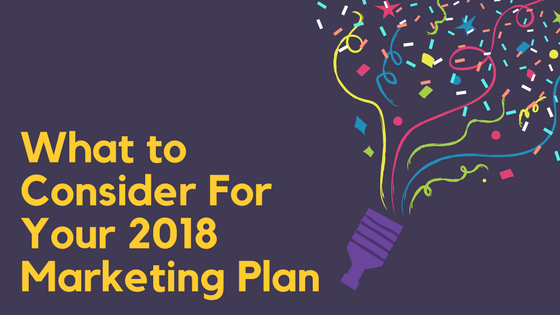 Although we can’t offer any advice on how to eat healthy or get back into shape, we can offer some advice on creating a Marketing Plan for 2018. With the global e-commerce market expected to reach $2.77 Billion in 2018 – opportunities are abundant for your online business. Let’s break down five topics to consider in your plan. Team: If you’re a wear-all-hats business owner, it’s important to prioritize tasks. After all, you can’t do it all, which is why setting up a plan is a good practice to reflect your team’s size and ability. Budget: The saying does go, “You oughta spend money to make money.” But don’t overdo it. Make sure you have a set marketing budget. This way your 2018 marketing strategy will be realistic and approachable. Tools: Plenty of tools out there to streamline your marketing strategy. If you’re using GrooveJar, you know how easy it is to collect more emails and run timed automated email messages. How is the current business performing? What should be done to improve performance? Where should business be at the end of the year? Then, it’s time to set your goals and objectives. They can range from entering a new market, streamlining your website, or just improving your social media. A tip to setting attainable goals is being SMART about it. Another tip is to not lose sight of year-end goals, break them down per month. For instance, you want to gain 25 reviews by the end of the year. If you break that down per month your goal is around 2 reviews per month. That doesn’t sound too bad, right? This makes it more realistic and attainable to let you keep your eye on the prize. It’s a problem if you don’t understand who your customers are. In order for a marketing plan to be effective, it’s crucial to know who they are in order to communicate your value effectively. Who are they? What do they buy? And what feedback do they offer? Look at your current customers. Sure, they may be diverse in some aspect, but you need to find out what they all have in common. Start off with your pool of customers who already buy from you and refine your results by considering things like their geographic location, demographics, gender, interests, values… the list can go on. You can even spy on your competitors’ social media accounts and see who follows/likes their pages to get a better sense of who’s interested in the same product/services. Don’t be afraid to survey your customers, keep it engaging and offer incentives for them to take a quick survey. This allows you to see what already works and what doesn’t, allowing you to adjust your marketing strategy for the better. You’re using GrooveJar for a reason. To collect more emails and win-back site visitors who would have otherwise just would have just left. Did you know email marketing has a 4400% ROI. Read this post “Mo Emails, Mo Money”. An oldie but goodie, the article puts it into perspective on how growing your email list leads to revenue growth. There’s also a video showing you how to use GrooveJar’s Collect & Convert auto-email functionality. It’s estimated that 2.46 billion people are on social media worldwide. Your target audience is on there and so should your online business. Knowing who your target audience is, you’ll be able to target people on social media by just knowing their common interests! Pretty neat. But, you don’t have to be on every platform. Manage your resources and use the ones you know will reach your target audience. Social media is also becoming more visual, so it’s important to include pictures with your posts. Take note from these 6 brands that are killing it on Instagram. Creating high-quality content will help rank better on search engines. Create a relevant blog by educating and engaging your prospective and frequent customers. This allows you to develop and maintain a relationship. It’s a great way to send out an email blast for people to come back to your site and be a brand that’s top-in-mind. That’s it. Consider ALL these things when developing your marketing plan this year. Happy New Year and we wish you success in your online business!